As the spouse of a print journalist and a long-term believer in the value of: (a) the value of local/state newspapers in democracy; and (b) the value of being able to hold something of a decent size in your hand (as opposed to my beloved iPhone) whilst eating breakfast in the morning, this news about news butters my bagel, indeed. Until medical science cures how human eyesight changes with age or the iPad becomes reasonable enough for everyone to have, hold and carry around with ’em, print newspapers should be a critical part of our lives. I love the Web and am a techno geek, to be sure; but until Web news can support the kind of journalism that keeps citizens informed about local school board decisions and tax rates, ferrets out corruption and serves as an objective watchdog of government, business and society, the continued health and well-being of newspapers in our democracy must be a societal priority. CHICAGO A new survey of news consumption in Britain should comfort newspaper publishers everywhere, according to McKinsey & Co. Adults under the age of 35 have significantly increased their consumption of news in the past three years — and they profess a growing interest in getting news from print newspapers. There’s also more urgency to get the news first in this group, McKinsey found, with about 40% saying they needed to be the first to hear breaking news. This need for immediacy is reflected in younger news consumers’ choice of media: they overwhelmingly prefer to get their news from television and the Internet,” the report says. But newspapers remain the most trusted medium, with 66% of respondents describing the paper as “informative and confidence inspiring.” That compares with 44% for television and just 12% for the Web. “This suggests that newspapers have further scope to go beyond news, to drive reader interest and advertising revenues at the same time,” Nattermann writes. And “interest” in getting news from newspapers has grown, the survey found. 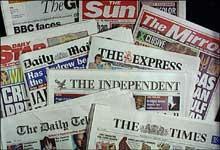 Among people aged 16 to 24, interest in newspaper news grew to 64% from 53% in a 2006 survey. In the 25-34 cohort, interest grew to 61% from 51%. There is an on-the-other-hand, though. This survey finds what countless others have: Little enthusiasm for paying for newspaper online content. McKinsey’s advice is for newspapers to use that trust factor to find revenue in transactions. “The combination of editorial content, ads, and selected commercial offers — while clearly separated — benefits advertisers and is of practical use to readers,” the report says. This song popped into my head as I read this story from PRWeek about a “reputation management” program that was inadvertently e-mailed to a Greenwich Post reporter who filed a story about it. A reputation management program? Just file that alongside the lions and tigers and bears (oh my!). Chilling, indeed. Pretty radical stuff, eh? Not to denigrate the Adams plan (which, in the spirit of full disclosure, I have not read in its entirety) or anything, but this sounds like a fairly straightforward plan of action that draws on time-tested public relations practices college freshman can find in PR 101. Most often what makes the difference between the success or failure of a plan is in its execution (at which the Adams group excels). Well, the story became “news” (and BGO uses that word loosely here) when supporters of a bill to tighten regulation and reporting requirements on the cruise line industry sought to build awareness of this “secret” plan via outreach to local media and the use of ambassadors – including bill sponsor Sen. John Kerry (D-MA), who posted the plan on his Web site. Irony (like comedy and politics) is sometimes not a pretty sight. For his part, Adams questioned the reporter’s “journalistic ethics” for reporting a story based on a document that he received accidentally. There’s certainly an argument to be made on both sides of that question, but the fact that seems overlooked here is whether what seems to be a standard public relations plan (developed by an excellent firm, I might add) to help an organization advocate its position on pending legislation is, in and of itself, newsworthy – especially when it arrived in a reporter’s hands purely by accident (so much for that legalese we call include on our messages: “If you have received this e-mail in error . . .”).